Urinary incontinence and the loss of bladder control affects people of all ages. Incontinence is especially common in the elderly and those with special needs. Whether you are someone with an incontinence problem, a loved one of somebody who does, or a caregiver, the Wet-Detective can help. The Wet-Detective is the right choice for those with common causes for urinary incontinence. 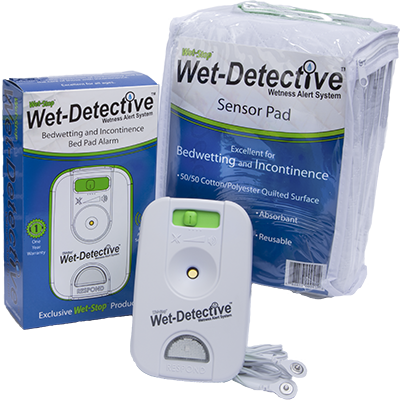 The Wet-Detective alarm system with the sensor pad allow those caring for people with incontinence to be gently notified when an accident occurs. 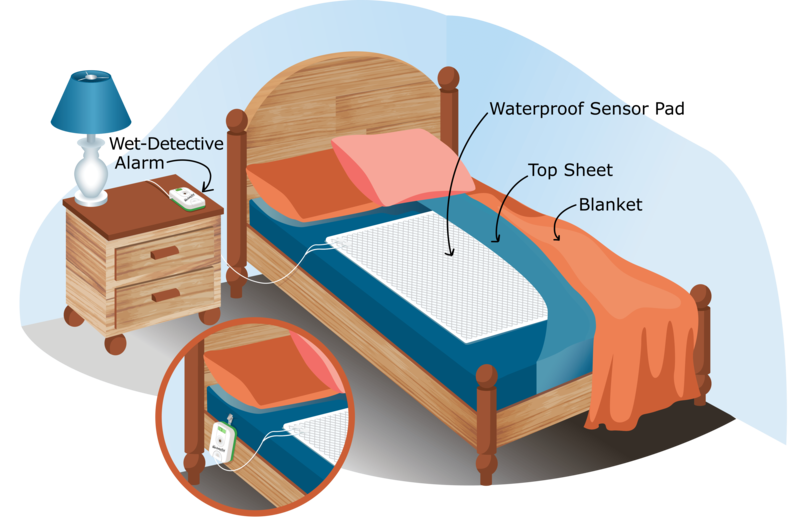 The sensor pad is typically placed on top of a bed and directly under the body, but it can also be placed on a chair or wheelchair. Incontinence care is especially important because it helps with hygiene, odor, and avoidance of bed sores. Some incontinent people are totally unaware when an accident occurs or they are unable to notify those caring for them that an incontinent episode has happened. The Wet-Detective notifies those caring for persons with incontinence that care is needed. The response from the sensor pad is quick and reliable. Alarm has 4 settings: silent, beep, medium beep, loud alarm. Alarm box is lightweight and can be clipped to bed or sheet. Alarm can be placed on bedside table. Flashing LED makes it easy to find in the dark. Silence or response button allows time to change pad or attend to other issues but does not allow you to forget the wetness. Sensor Pad is completely unique from the rest. It is a large quality washable, waterproof, and reusable pad. It easily connects to the alarm via the cable that simply snaps onto the pad. Wet-Detective Alarm System comes with one pad but you can order them separately.